There is growing number of windows and doors popping up now in the current popular colour of anthracite. To go along with this the Blind trade has moved with the times. 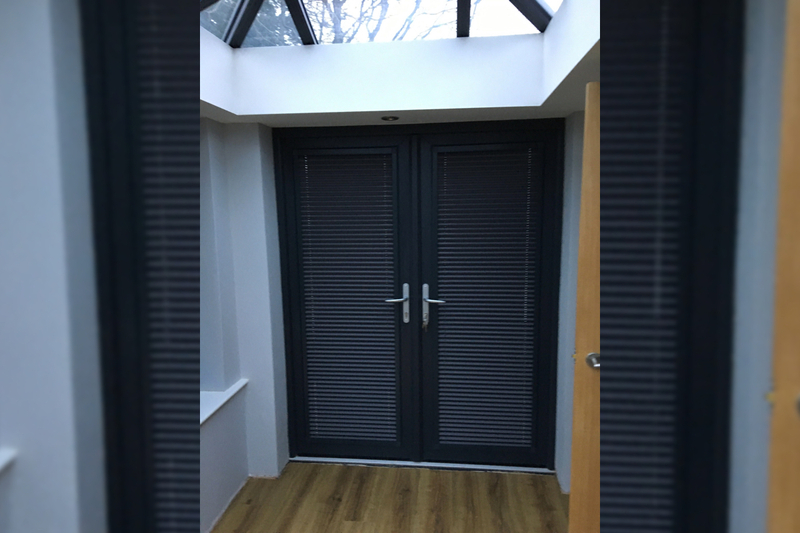 These Perfect Fit Pleated Blinds in grey, come complete with anthracite frames, matching perfectly with the window frames of this new conservatory in Watcombe Park, Torquay. If you would like a quote, or just some advice, then give me a call, or fill out the form on this page and I will get back to you within 24 hours. 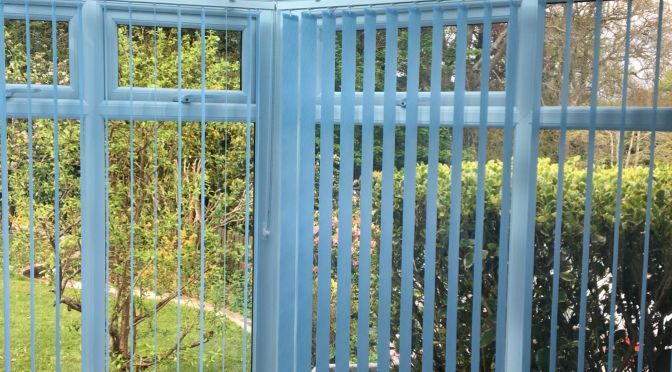 When choosing Wood Venetian Blinds, one decision to be made isa whether to have ladder strings or tapes. Both look good. 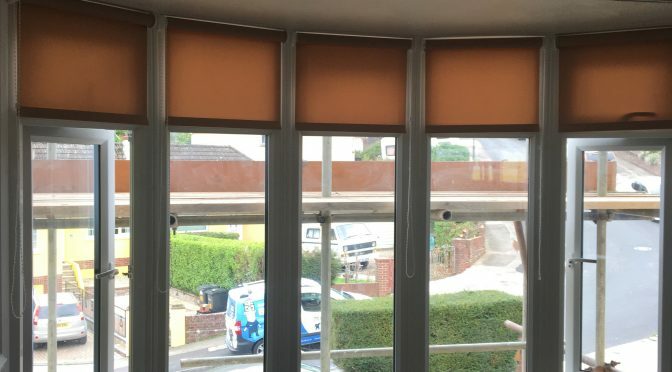 The main difference, for me, is that the tapes give the Blind more of a look of a shutter, but at a fraction of the cost. They also allow more light into a room than shutters. 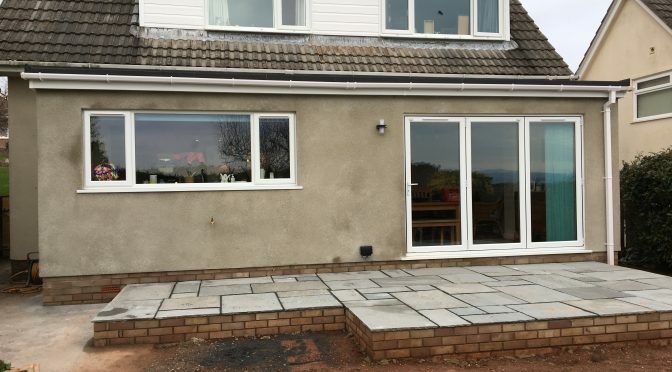 A recent job in Paignton involved 2 bay windows. One was the lounge and the other the main bedroom. 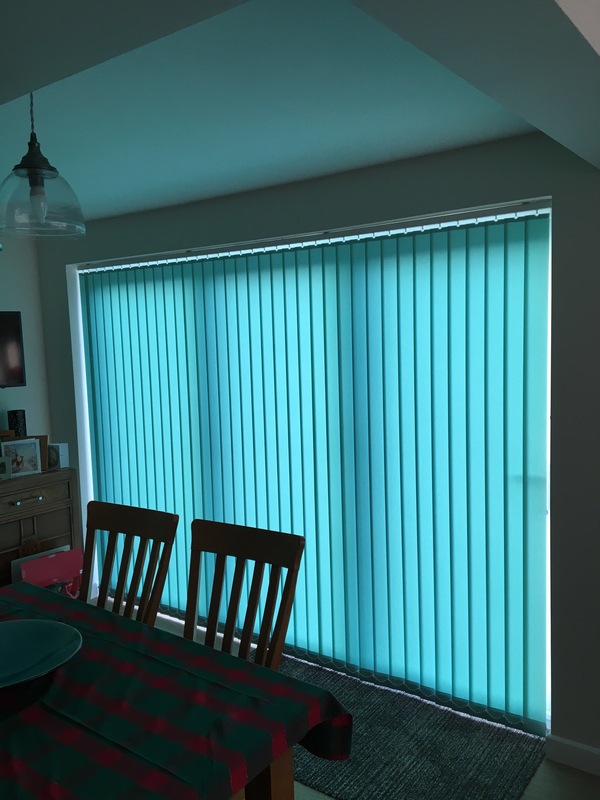 The customer wanted the same colour in both, but blackout in the bedroom. No problem, palette fabric in the lounge and a banlight matching fabric in the bedroom. Whatever you need I can usually find a solution. So if you want a quote, or just some advice, give me a call or fill out the form and I will get back to you within 24 hours. 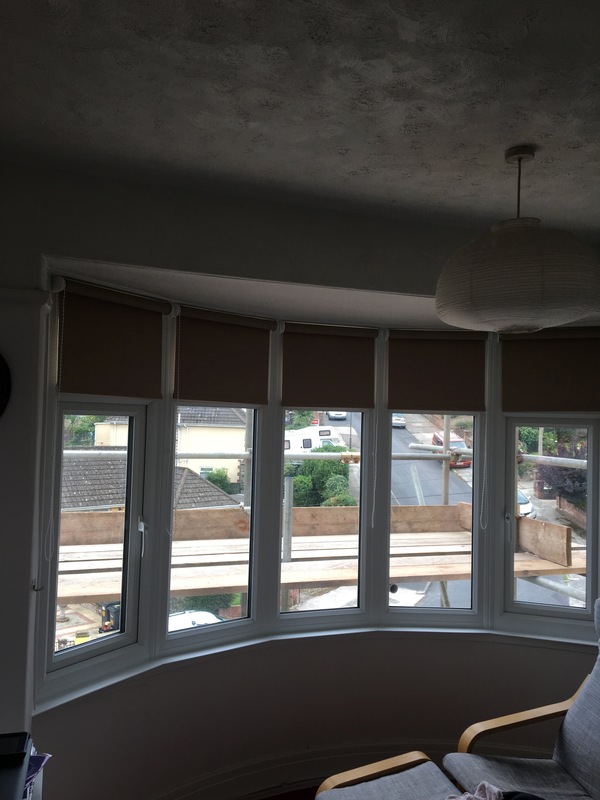 After much consideration of the alternatives, this Paignton customer decided to got for 3 25mm Venetian Blinds to cover her 5 bay bedroom window. 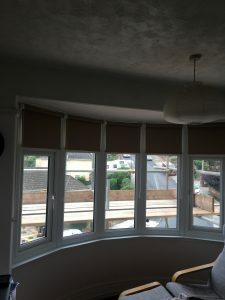 The reason for the 2 side Blinds each covering 2 windows was at the customers request. 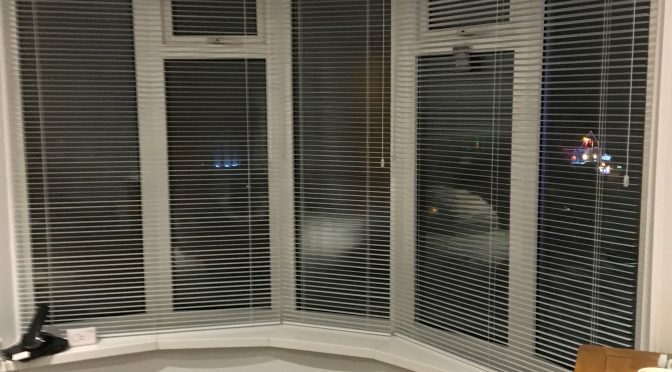 The reason being it gave less spaces between Blinds, as she is a Night Nurse and sleeps during the day. The decision making was a long process, but the result was right as I have another happy and satisfied customer. If you would like a quote give me a call, or fill out the form on this page and I will get back to you within 24 hours. 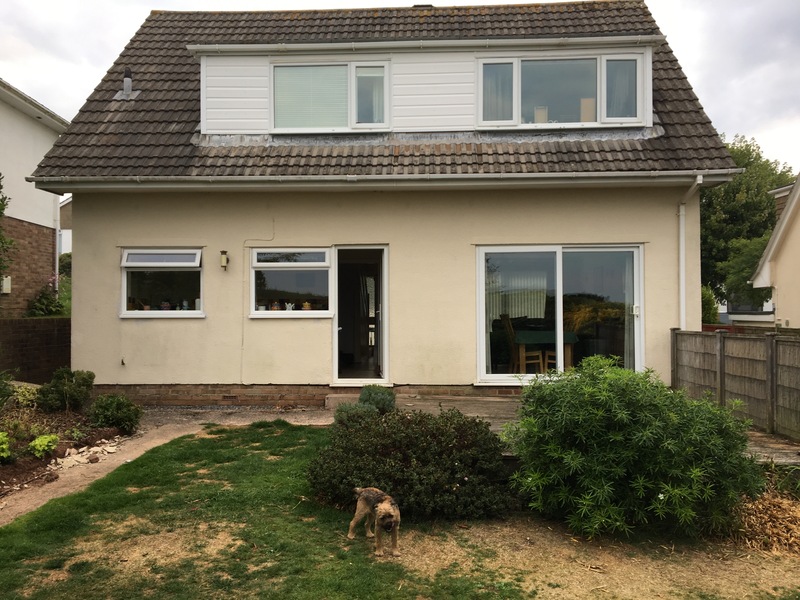 I have finally reached the end of the building of my own extension. 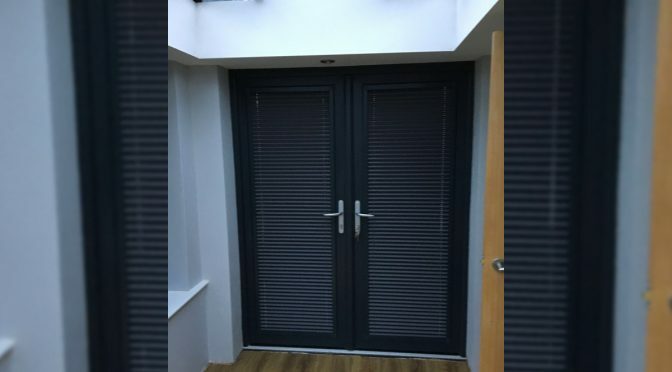 The final piece was the selection of Blinds. 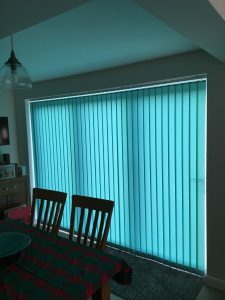 We decided on a bright colour as the rest of the large room was fairly neutral. 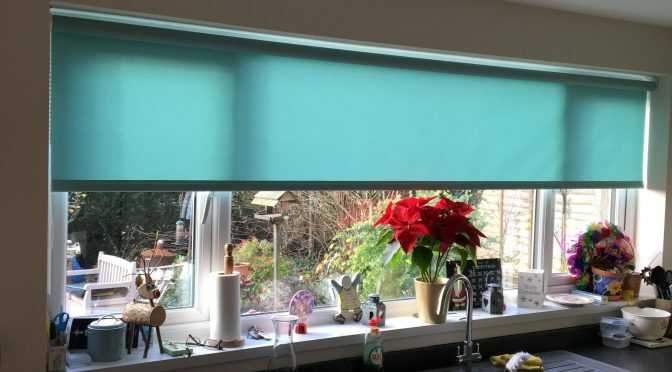 With a roller blind at the large kitchen window, we complimented it with a vertical blind, in the same colour, at the bi-fold doors. Very happy with the result. If you would like a quote, give me a call or fill out the form on this page and I will get back to you within 24 hours. 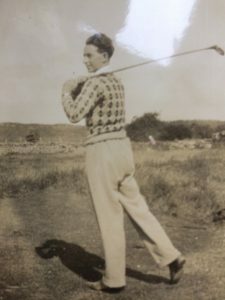 Having maintained a handicap of 5 for the last 30 years or so, I recently found photographic evidence of my golfing heritage. Clearing out my late mothers house I came across pictures of her Mum & Dad, my grandparents. 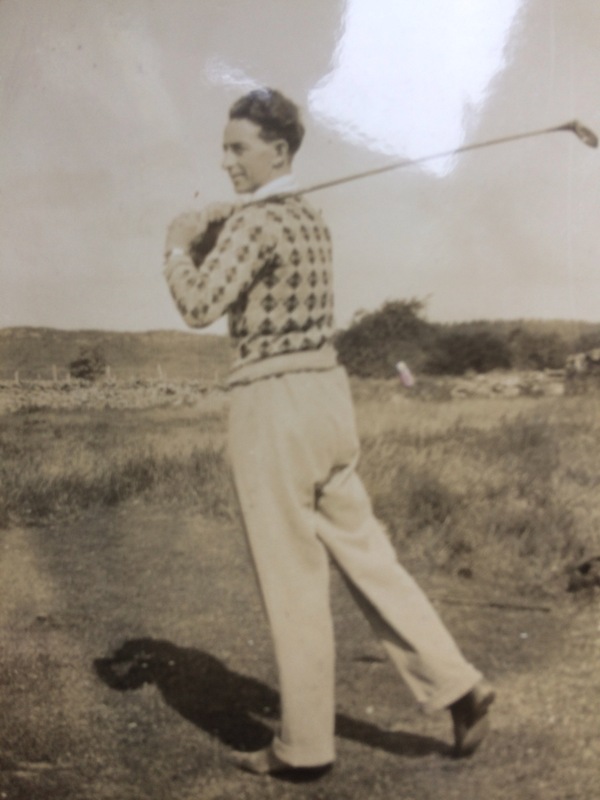 I knew Grandad was a golfer, but he’d long stopped playing when I was growing up. Turns out he was a club captain and had a lowest handicap of 3. 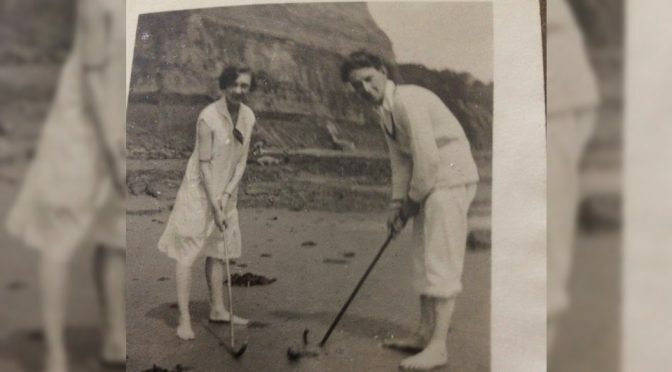 Here we see him on the beach in his home Dumfries, with my Nan. Wish I could have had one round with him with us both at our peaks. My Blind business is enabling me to continue to enjoy my golf into later life. So if you would like a quote fill out the form on this page and I will get back to you within 24 hours. 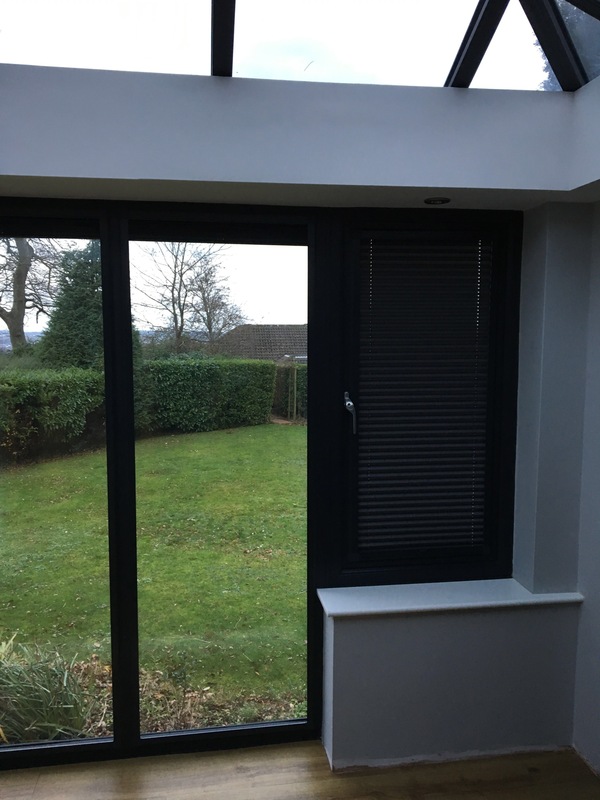 After 4 months of living in a building site, our extension was finally completed, in time for Christmas. 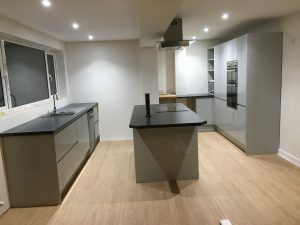 We’ve gone from a though lounge/diner and small kitchen to a decent sized lounge and a massive kitchen/dining/living space. It’s been well worth all the upheaval and many thanks go to Nic Chapman and Son for their excellent work throughout the build. 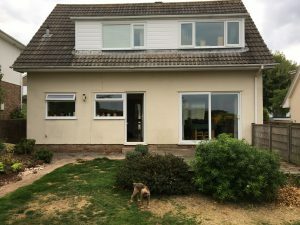 Now to find the money to paint the outside, put down new lawn, garden furniture etc etc. So to that end, if you would like a quote give me a call or fill out the form on this page and I will get back to your within 24 hours. 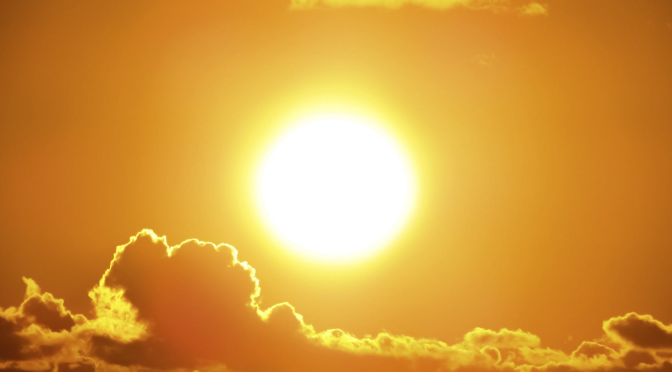 New high in our heatwave summer! I’ve been on holiday to various parts of the world, but rarely experience temperatures at the level we’ve had in our own country this summer. The high for me, on The English Rivera, was 33 degrees in early July. Thankfully we don’t get the humidity that some countries have, otherwise it would make work unbearable. Fortunately it is bearable, so if you would like a quote, or just some advice, then give me a ring or fill out the form on this page for a call back. 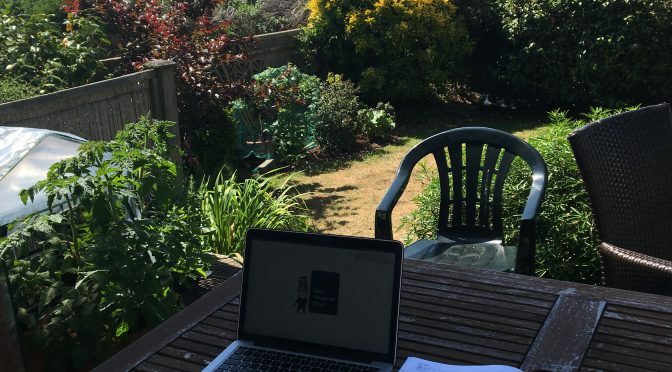 One of the joys of the lovely summer we’ve been enjoying is being able to catch up on paperwork outside. Sun umbrella up, lap top ready, cold drink to hand and work away. If only it was like this every summer in England. If you would like a quote, or just some advice, then give me a ring or fill out the form on this page for a call back. Having been doing this for 30 years now, I often go back to customers I’ve seen before. Sometimes at the same house or maybe when they’ve moved on. I recently went back to a property I’d been to several times over the years, for two lovely ladies. 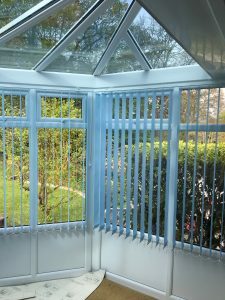 The property has now changed hands and I was pleased to fit Vertical Blinds, in the new conservatory for the new owners. 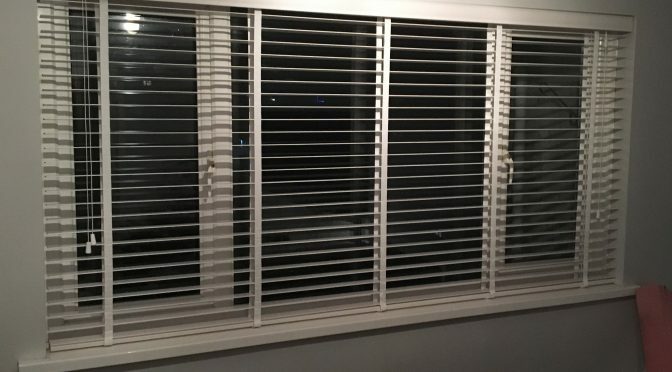 It was also good to see many of my Blinds still there and working well. If you would like a quote or some information fill in the form on this page for a call back, or call me now.